Chilly days mean warm hearty soup! Did you know that January is National Soup Month? I didn’t know until my sister brought it up to me. I've been making a lot of soups lately including, most recently, my recipe for Butternut Squash Apple Ginger Soup made in the Instant Pot. Check out all the soups, stews, and chilis on my blog if you like right HERE. A couple of my quick and easy stove-top soup favourites are: Healthy Carrot Orange Ginger Soup and Dutch Vegetable Soup with Meatballs. For whatever reason, my husband, Scott, was in the mood for Beef and Barley Soup. I’ve known this man since we’ve been in high school together; I’m not telling you how old I am, but fun fact: Scott and I share the same birthday (year and all!). Anyway, I’ve have never seen him order or make this soup ever. So I asked him why and he said, that he had totally forgotten about it. Apparently, he never had it growing up, so it never came to mind. When we got our Instant Pot, we were looking around for ideas of what to make in it. 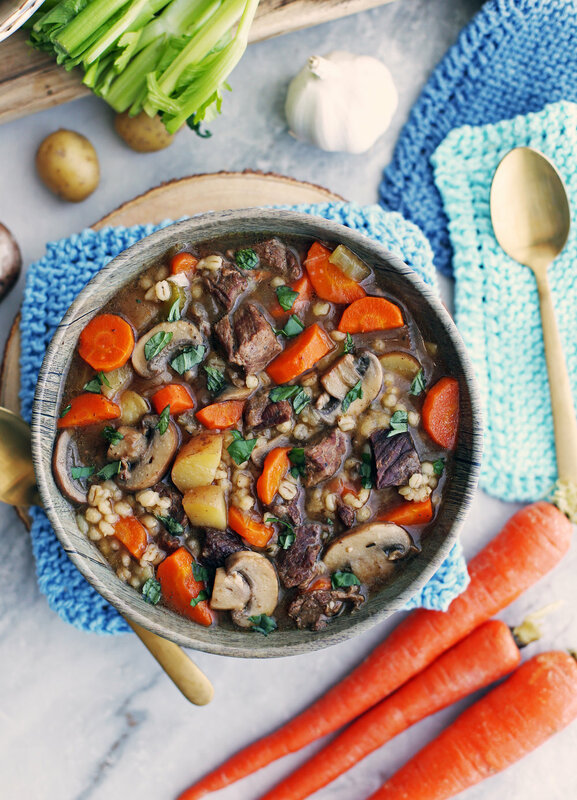 Following the success of our other Instant Pot recipes, I wanted to try a more classic beef soup and this one really hits the spot. Now, it's Scott's favourite Instant Pot creation to date. Prepare by measuring, slicing, and chopping the ingredients in the soup. Ingredient amounts and full instructions down below in the recipe card. Cut the stewing beef into 1-inch beef pieces, making sure to remove the super tough gristle (cartilage that won't break down). Season with salt and pepper and brown all sides. Fragrant onions, garlic, and mushrooms that were sauteed in the pot then deglazed with beef broth and splashed with a little balsamic vinegar. All the ingredients (veggies, barley, dried herbs, and browned meat) are added to the pot. Top it off with beef broth and water (not shown). Seal and cook under high pressure for 25 minutes with at least 15 minutes of natural pressure release before quick release. Open and you've got a yummy soup! Is comforting, flavourful, and filling: It’s cozy comfort food that warms you up on these cold, wintery days and nights. Simple to prepare and one-pot (Instant Pot that is): Clean-up is a breeze. Is full of tender, small bits of brown stewing beef that are full of savoury, umami flavour. Chuck roast is a preferred cut since it has great flavour and lots of fat and connective tissues that will break down as it stews into super tender and scrumptious bites. However, I often lazy out and buy the meat labelled stew beef at the supermarket. Look for pieces that are uniform in appearance. At home, I always go through, remove excess gristle (very tough, inedible cartilage tissue that won’t break down), and cut the pieces down to similar sizes before browning and stewing. Contains delicious pearl barley: this versatile grain is slightly chewy with a nutty flavour. It bulks up this thick and hearty soup. Is rich with fresh vegetables and mushrooms: It has the wonderful and colourful combination of aromatic onion, garlic, carrot, and celery as well as cremini mushrooms (baby bella are great too), which has a lovely earthy flavour and meaty texture to it. Season the stewing beef with salt and pepper. Using the “saute” function on the Instant Pot, add one tablespoon of olive oil and brown beef on all sides (you may need to do this in batches). Remove the beef and set aside. Pour another tablespoon of olive oil into the Instant Pot and add the onion, stirring until soft and starts to brown, about 2-3 minutes. Add in the garlic and mushrooms and saute for 3-4 minutes, until the mushrooms are tender and brown and most of the liquid from the mushrooms evaporate. Add 2 tablespoons of beef broth to deglaze the pot, stirring and scraping the bottom of the pot to remove/dissolve the brown bits. Pour in the balsamic vinegar and stir to mix in. Add back in the beef along with the rest of the ingredients. Season with a pinch of salt and pepper. Give the ingredients a good stir to distribute throughout the vessel *(see first note). Press “cancel” to turn off the Instant Pot. Seal the Instant Pot and cook at high pressure (“manual”/"pressure cook" function) for 25 minutes. After the stew is ready, allow natural pressure release for at least 15 minutes before quick pressure release to completely depressurize (until floating valve drops). Open the Instant Pot and give the soup another stir. Taste for additional salt and pepper and top with fresh basil if you like. Best served hot. *The beef broth should cover the top of the ingredients. Add more beef broth (or water) if necessary. Makes 9-10 cups. The soup will continue to thicken as it cools down. Nutritional calories represent one serving with 8 servings total.